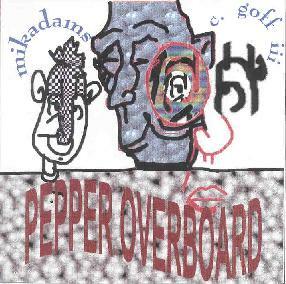 Charles Rice Goff III & Mikadams - "Pepper Overboard"
On Pepper Overboard, C. Goff III teams up with his Turkey Makes Me Sleepy cohort, Mikadams, for some acoustic guitar explorations. It took me a few spins to tune into this music, but the considered headphones listen finally revealed an often mind-bending blend of free-improvisation, captivating melodic drift, and avant-folk that produced the same effect that a lot of psychedelic albums do. The duo employ various tunings, and the efx'd embellishments often kick things up into the cosmos, without losing the principle acoustic focus. The duo get things stirring with "Ice Water", which has a bit of John Fahey feel. "Extroduction" is somewhat similar, but more avant free-improv, and I even detected a slight, trippy Indian influenced vibe. "Plectrum's Promise" moves further into experimental free-improv territory as the guitars duel with a whining efx'd pattern. "Grooves And Goes Insane" includes lots of nice playing and good ideas, with the boys just letting their hair down for an all out acoustic jam. "Zebraskin" is very different, traveling deep into sound sculpture realms, with ethnic percussion, chanting, the sounds of jungle wildlife, and various other fun efx. Listening to this I imagined myself as the adventurer cutting a path through the Amazon as the cannibals and creatures plotted against me. But at 28 minutes, "Vondjina" is the epic of the set. Goff and Mikadams build their themes slowly, with thoughtful measured phrases and scenes. It's difficult to describe (give ‘em an A+ for that) but I hear a variety of influences including folk, blues, progressive, experimental, and much more... all coming together in a glom that fits together nicely and, like the rest of the album, carried me along on an enjoyable Sunday drive through a strange, paisley Pepperland (though I never fell overboard as the title threatens). Overall, a nice listen for those who want a relaxing journey that strays far from the beaten path. No more... no less.